With additional funding from the state legislature, some school districts in the Treasure Valley will be offering full-day kindergarten next school year. BOISE, Idaho — Four Treasure Valley school districts will be offering more full-time, all-day kindergarten options for the 2019-2020 school year. Earlier this year, Gov. Brad Little and the state legislature doubled the funding for early literacy programs. Now, some of the Treasure Valley school districts are using that funding to grow kindergarten programs. Caldwell, Nampa and Vallivue school districts have all officially announced they will be offering tuition-free, all-day kindergarten to all of those districts' elementary schools next year. "So next year we will be able to offer kindergarten full-time in every elementary school within the district,” Dr. Shalene French, superintendent for the Caldwell School District, announced in a Facebook video post. Vallivue School District spokesman Joey Palmer did something similar with a Facebook video message. “The school board has approved all-day, every day, full-time for the 2019-2020 school year,” he said. In a statement emailed to KTVB, the Nampa School District superintendent Paula Kellerer, also confirmed it would be offering full-day kindergarten. 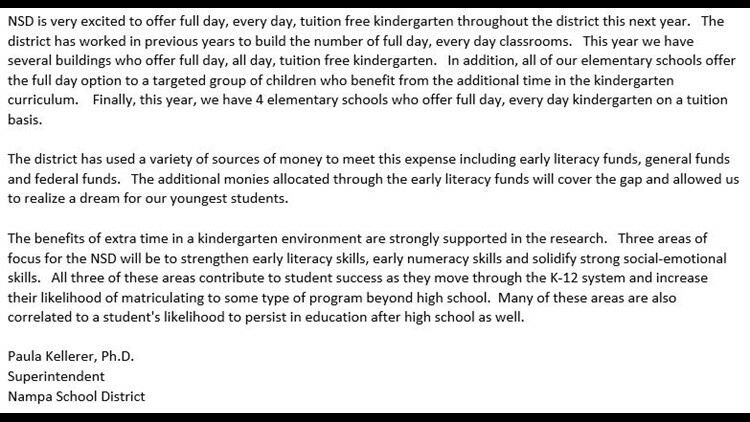 The statement reads in part, "NSD is very excited to offer full day, every day, tuition-free kindergarten throughout the district this next year." Beth Oppenheimer is a member of the Boise School District school board and also executive director of the Idaho Association for the Education of Young Children. She says Boise will also be expanding its full-day kindergarten next year to include 15 elementary schools and nearly double the enrollment for kindergarten. However, Oppenheimer said, unlike the other districts, Boise's will not be tuition-free. She said it's something the board is working on, but for now, parents pay part of the fees for full-day kindergarten. “So parents can choose to have their children in a full day program but they would have to pay for the other half of the day of the program based on their income level,” she explained. Oppenheimer said overall, this change to allow full-day kindergarten for more students is key to a child's learning. Oppenheimer said a lot of kids end up playing catch up in the classroom. Oppenheimer added full-day kindergarten also benefits kindergarten teachers because it allows more time in the classroom to prepare kids for first grade and also evens the playing field among all kids. It also, Oppenheimer said, affects working families because it eases the burden of what to do with their kids. The school districts are excited about the change. KTVB also reached out to West Ada School District to see if there were similar plans for kindergarten there. We were unable to reach anyone with the district for comment.